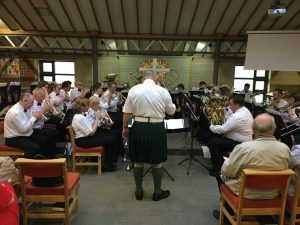 On Saturday 16th June Trentham Brass returned to St Luke’s Church, Clayton. The audience thoroughly enjoyed the wide variety of music chosen. The solos and features were particularly well received. ‘Bright Eyes’ – What an amazing back row cornet section! ‘Another Fine Mess’ – on trombones? So comical! ‘Rusalka’s Song to the Moon’ was passionate and well supported by the band. The Bari duet, ‘Perhaps Love’ was played superbly. The virtuosic playing of ‘Napoli’ by our principal Euphonium player and Monti’s ‘Czardas’ by our very talented Eb Bass player beggars belief!